In some cities, grease is out of control. Did you know it is estimated that 544,000 gallons of grease fill Seattle, WA’s drains each month according to a 2010 report? That is enough to fill seven large swimming pools! This grease is causing major plumbing and sewer issues costing the city a lot of money. Local officials are fighting back though. Did you know, as a restaurant or commercial kitchen, you can be held responsible for the grease that your exits your facility? In 2009, Fairfax County, Va., officials sued Krispy Kreme for $20 million, alleging that years of greasy waste from a donut plant had fouled up the sewer system. “The ‘excess fats, oils and grease’ have built up in the system, destroying iron pipes, mechanical pumps and other equipment and caused leaks, according to court filings.” You can read more of the article here. Don’t let this happen to you! 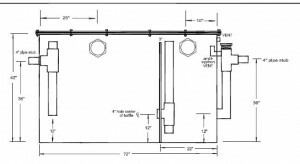 Drain-Net can equip your restaurant or commercial kitchen with the equipment you need to make you compliant with local ordinances and keep your sewer water grease-free. 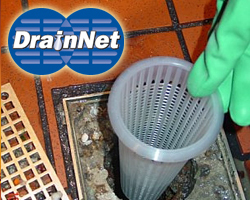 Drain-Net offers Grease Traps, Grease Monitors, Basket strainers, and much more.